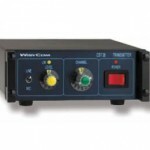 Emetteur Wysicom CTK38 (1 watt). Temperature d’utilisation -10 ÷ +55 °C. RF output impedance 50 ohm (type N-F connector). Remote PTT (Push To Talk) circuit, wired to Ľ” (6.3 mm) mono jack connector. Peak-limiter automatic, with dynamic-range > 30 dB over the level set for the nominal modulation. NR system compressor circuit with noise-gate, specially adapted to the MicroEar receivers. AF bandwidth 200 Hz ÷ 5 kHz (-3 dB). Distortion < 0.5 % (0.25% typ.). SND/N ratio > 80 dB (83 dB typ. ), CCITT measured. Powering 10.5 ÷ 16 Vdc, 300 mA max. (negative ground). Dimensions 40 x 120 x 175 mm.